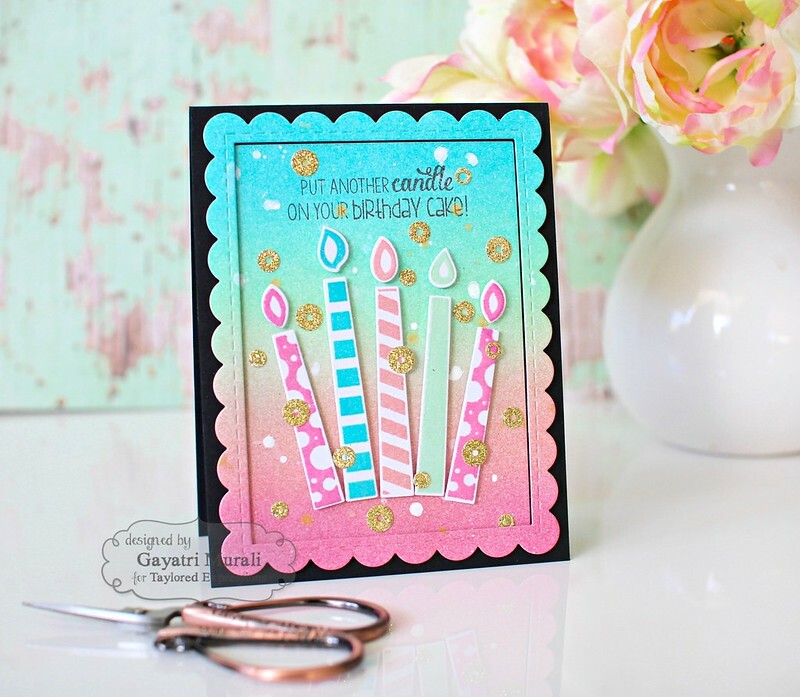 Put another candle on your Birthday Cake! Happy weekend! I got to sleep in this morning to catch up on much lost sleep. Yesterday I had time to craft and I wanted to do my favourite technique of ink blending. 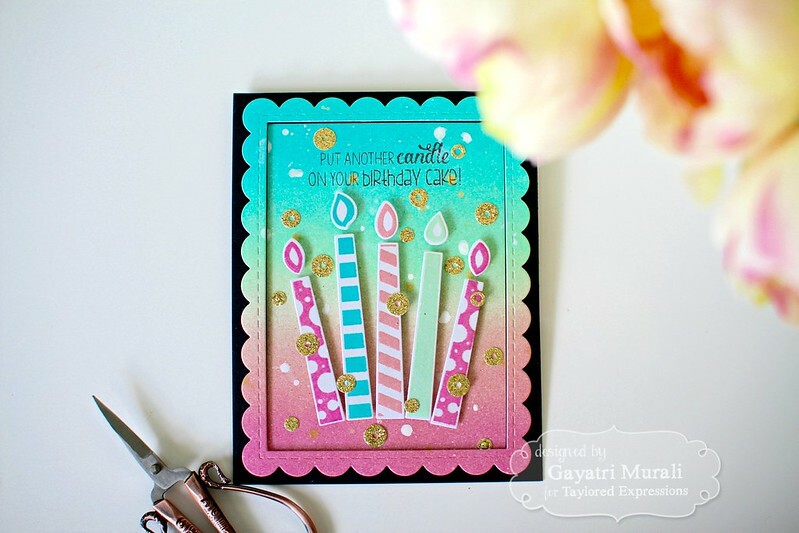 I also played with couple of new release stamp sets and dies from Taylored Expressions to make this birthday card. I have used Taylored Expressions dye inks to do ink blending for the background. The colours I used are Pink Champagne, Strawberry Milkshake, Mint Julep and Cookie Monster. A lot of back and forth blending to build up the colour intensity. I love taking that time to get beautiful coverage and blending. The result brings a sense of achievement and pride Lol! I then spatter the panel with white Mr. Huey and Gold Colorshine from Heidi Swapp and left it to dry. 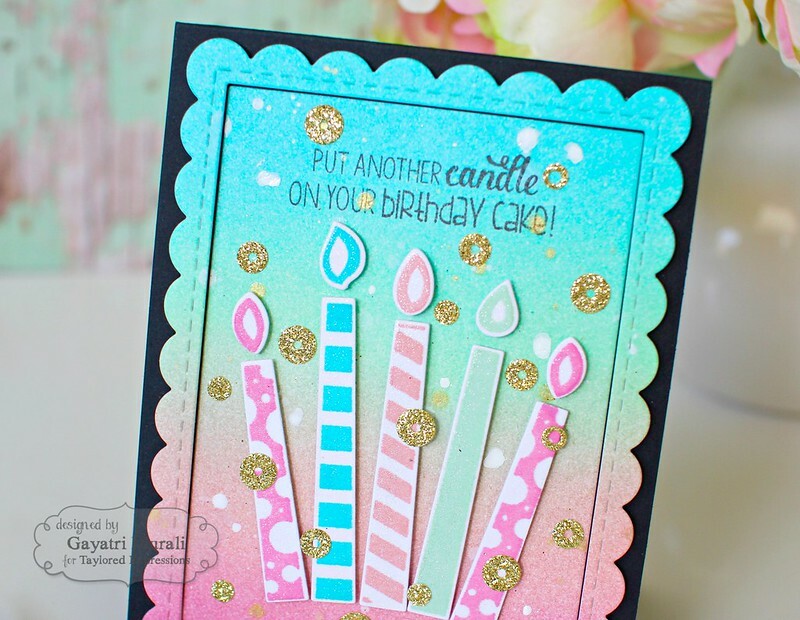 I then stamped the candles from Make a Wish Stamp set and Die combo using the same colour dye inks from Taylored Expressions and mini Misti. I did stamped them three times as I wanted them a bit darker than the background colour. They are all then die cut using the coordinating dies. I die cut the background using Frame in Frame 2 cutting plate. I used the largest die from the set. This is a frame die but I am using both the inner panel as well. I adhered the candles on the inner panel using foam adhesives and stamped the sentiment using Black Hybrid ink from Taylored Expressions. The sentiment is from Bright Birthday stamp set. I would heat emboss the sentiment next time as I felt the sentiment was not bright enough. Anyway, I adhered the scallop panel using foam adhesives on the Oreo card base and flush glued the inner panel. I also die cut a few sequins using Little Bits: Sequins Confetti dies and gold glitter paper. I adhered them as shown in the picture. I love how this card turned out and the contrast against the back base. Hope you do too. I have listed all the products I have used on this card below. this is simply stunning Gayatri. I really love the soft background. You really have an amazing skill with blending your inks. Love your hand made sequins too! love the soft pastel colors against the black great look!